To Cite: Seyed Razi N, Seydi E, Nazemi M, Arast Y, Pourahmad J. Selective Toxicity of Persian Gulf Sea Squirt (Phallusia nigra) Extract on Isolated Mitochondria Obtained from Liver Hepatocytes of Hepatocellular Carcinoma Induced Rat, Hepat Mon. 2017 ; 17(2):e41489. doi: 10.5812/hepatmon.41489. Background: One of the deadliest types of liver cancer is hepatocellular carcinoma (HCC). The current treatment methods show poor tolerance and low efficacy. Phallusia nigra (P. nigra) is a kind of sea squirt or marine tunicate that lives in tropical seas around the world. As a marine animal, it contains natural bioactive products. It has been shown that P. nigra has some biological properties, including anti-inflammatory property. Objectives: In this study, we examined the selective toxicity of methanolic extracts obtained from body and wall of Persian Gulf P. nigra on isolated mitochondria obtained from liver hepatocytes of hepatocellular carcinoma-induced rats. Methods: For induction of HCC, the rats were injected with a single dose of diethyl nitrosamine (DEN) at 200 mg/kg, followed by dietary administration of 2-acetylaminofluorene (2-AAF) (0.02%) for 14 days. Then, the HCC induction was approved by histopathological evaluations, liver function markers (ALT, AST, and ALP), and determination of blood levels of liver cancer specific marker, i.e. alpha-fetoprotein (AFP). At the end, mitochondria isolated from cancerous and normal hepatocytes were applied for subsequent investigations. Results: Our results showed that different concentrations (250, 500, and 1000 μg/mL) of both extracts (from body and wall) significantly induced reactive oxygen species (ROS) formation, promoted mitochondrial swelling, decreased mitochondrial membrane potential (MMP), and increased cytochrome c release only in HCC hepatocyte mitochondria in a time and concentration dependent manner. No significant change in the above mentioned parameters was observed in the control hepatocyte mitochondria. Conclusions: Our results suggest that bioactive compounds of P. nigra could be promising anti-HCC molecules. However, further studies are needed including molecular identification tests, confirmatory in vivo experiments, and clinical trials. Hepatocellular carcinoma (HCC) is the most frequently occurring liver cancer and the fifth malignant tumor worldwide (1, 2). HCC commonly results from viral hepatitis B and C infections, chemical carcinogen exposure, food additives, non-alcoholic fatty liver disease, obesity, air and water contaminants, and environmental pollution due to industrial toxic chemicals (3, 4). HCC treatment involves chemotherapy, liver transplantation, and resectioning. However, such treatments are considered to have low efficacy along with poor subsequent survival and high recurrence rate (5). Hence, effective drug treatment for HCC is of urgent need. Alternatively, biologically active natural compounds can be used as promising agents for treatment of cancers including HCC. In the past decade, more than 300 patients have been subjected to potential anticancer compounds derived from sea products (6). Moreover, within the last five decades, natural marine products have attracted considerable attention, as they are considered a source of potential anti-cancer drugs (7). One particular marine organism, Ascidians, has shown potent anti-tumoral and antiviral activities (8). Different extracts of various tunicates such as, Isogranulatimide from Didemnum granulatum, Aplidinone A from Aplidiumconicum, Cephalostatin from Cephalodiscus gilchristi, Styelin D from Styelaclava, Lissoclinamides from Lissoclinum patella have shown antitumor activities against various cell lines (9-16). The ethanolic extract of P. nigra was shown to have anti-proliferative and immune modulatory effects on DLA and EAC cells (8). P. nigra is a sea squirt found in Persian Gulf. It is classified in the genus of Phallusia, family of Ascidiidae, suborder of Phlebobranchia, order of Enterogona, class of Ascidiacea, subphylum of Urochordata, and phylum of Chordata. Though some reports are available on the effects of extracts of different marine species, more information is warranted on the toxicity of P. nigra in HCC. The aim of this study was to study the cytotoxicity effect of P. nigra extracts on liver mitochondria isolated from a HCC rat model. Since all mitochondrial pathways may be involved by P. nigra cytotoxicity and due to the inherent importance of mitochondria in the induction of apoptosis, we planned this study to investigate upstream mitochondrial factors and identify the potential anticancer activity of bioactive compounds found in the Persian Gulf sea squirt. For the first time, this project evaluates the selective toxicity of extracts of the Persian Gulf sea squirt (P. nigra) in HCC cancerous hepatocytes and mitochondria. The outcome of this research can be applied to the vital improvement of HCC treatments through molecular identification of P. nigra bioactive compounds, confirmatory in vivo experiments, and clinical trials. P. nigra samples were gathered from the coast of Persian Gulf in Hormozgan province, south of Iran. The body and wall of P. nigra were separated at the Persian Gulf and Oman Sea Ecological Research Institute, Bandar Abbas, Iran. The extraction process was then carried out. Methanolic extracts from both wall and body specimens were prepared according to the method described by Sarhadizadeh et al. (17). Briefly, the sea squirt wall and body samples were washed by distilled water, cut into small pieces, homogenized by stirring, and suspended in methanol for 72 hours at room temperature. The suspension was centrifuged for 15 minutes (30,000 × g, 4°C) and then evaporated by a rotary evaporator at 45°C under vacuum. The obtained powder was stored at -20°C. Male Sprague-Dawley rats (120 - 130 g) were purchased from Institute Pasteur (Tehran, Iran) and kept for 12 hours of daylight in an air-controlled room (20 - 25°C temperature, 50% - 60% humidity). All experiments were conducted according to the ethical standards of the Committee of Animal Experimentation of Shahid Beheshti University of Medical Sciences in Tehran, Iran. The rats were divided into two groups: (A) the control group composed of healthy rats and, (B) the case group comprising HCC rats. The disease was induced in the rats by intraperitoneal injection of DEN (a single dose of 200 mg/kg body weight). Two weeks following the injection, 2-acetylaminofluorene (2-AAF 0.02%, w/w) was administered 2 times, every 2 weeks, to promote the cancer (18, 19). Serum alpha-fetoprotein (AFP) as a tumor marker of HCC, liver function, and liver histopathology of treated rats were examined to determine the induction of cancer. By using the ADVIA Centaur AFP bioassay (Sie-mens, Germany), the concentration of Serum alpha-fetoprotein (AFP) was tested (19). Moreover, alkaline phosphatase (ALP), Serum alanine transaminase (ALT), and aspartate transaminase (AST) as liver enzymes were examined by Hi-tachi-912 chemistry analyzer (Mannheim, Germany) using standard diagnostic kits (Roche Diagnostics) (19). Histopathological evaluation was performed as a complementary test. According to the standard procedure, small pieces of liver tissue fixed by formalin and paraffin-embedded (FFPE) to maintain their natural shape were stained with eosin and hematoxylin (H and E). Then, the intensity of lesions was evaluated under light microscopy. Hepatocytes were isolated using collagenase liver perfusion method. The cell viability was examined by trypan blue exclusion test. The mitochondria were prepared from hepatocytes for mitochondrial parameters assay. Briefly, the hepatocytes were pelleted (300 g for 3 min) and re-suspended in 10 mL of solution A (0.25 M of sucrose, 0.01 M of tricine, 1 mM of EDTA, 10 mM of NaH2PO4, and 2 mM of MgCl2; pH = 8). Subsequently, it was frozen at -80°C for 10 minutes to break the plasma membrane and centrifuged at 760 g for 5 min. The supernatant was kept while the pellet was homogenized for 10 minutes, followed by centrifugation at 760 g for 5 minutes. The supernatants from the two previous steps were combined and centrifuged for 20 min at 8,000 g. The final mitochondria containing pellet was suspended in Tris buffer (0.05 M of Tris-HCl, 0.25 M of sucrose, 20 mM of KCl, 2.0 mM of MgCl2, and 1.0 mM of Na2HPO4; pH = 7.4) at 4°C (18, 20, 21). Briefly, the activity of mitochondrial complex II or SDH activity was determined by using MTT test. In order to do this assessment, 100 μl of mitochondrial suspension was incubated with different concentrations (10, 25, 50,100, 250, 500, and 1000 µg/ml) of methanolic extracts from P. nigra body and wall at 37°C for 1 hour. Then, 0.4% of MTT was added to the above suspensions and incubated for 30 minutes. Finally, 100 μl DMSO was added and the absorbance at 580 nm was measured by an ELISA reader (Tecan, Rainbow Thermo, Austria) (22). At first, the mitochondrial suspensions from both groups were suspended in respiration buffer containing 20 mM of Mops, 10 mM of Tris, 0.32 mM of sucrose, 0.5 mM of MgCl2, 0.1 mM of KH2PO4, 5 mM of sodium succinate, and 50 μM of EGTA. After that, Dichlorofluorescein Diacetate (DCFH-DA, at final concentration=10 μM) was added and incubated for 10 min-utes at 37°C to measure the ROS level induced by P. nigra. Finally, the Shi-madzu RF5000U fluorescence spectrophotometer (EXλ = 488 nm and EMλ = 527 nm) was used to determine the intensity of fluorescence induced by dichlorofluorescein (DCF) (23). The cationic fluorescent dye (Rhodamine 123, Rh 123) was used to determine the amount of uptake of mitochondrial membrane potential (MMP). Rh 123 (at final concentration of 10 μM) was added to the mito-chondrial suspensions obtained from the two groups (1000 μg mitochondrial protein/mL) in the MMP assay buffer containing 2 mM of MgCl2, 10 mM of KCl, 5 mM of KH2PO4, 68 mM of D-mannitol, 50 μM of EGTA, 5 mM of sodium succinate, 10 mM of HEPES, 220 mM of sucrose and 2 μM of rotenone. Then, the amount of uptake was determined by a Shimadzu RF5000U fluorescence spectrophotometer which was set at the EXλ = 490 nm and EMλ = 535 nm (23). The isolated mitochondria were suspended in swelling buffer (70 mM of sucrose, 230 mM of mannitol, 3 mM of HEPES, 2 mM of Tris-phosphate, 5 mM of suc-cinate, and 1 μM of rotenone) and then incubated at 30°C with different concentrations of methanolic extracts from P. nigra body and wall (250, 500 and 1000 μg/mL). The absorbance was determined at 540 nm at 15-minutes intervals by an ELISA reader (Tecan, Rainbow Thermo, Austria) (23). GraphPad Prism software (version 5) was applied for statistical analysis. The experiments were performed in five replicates (n = 5), and the results were presented as mean ± SD. One-way ANOVA with post hoc Tukey test was used. Two-way ANOVA, followed by post hoc Bonferroni test, was performed in certain experiments as well. Statistical significance was set at P < 0.05. As shown in Table 1, a significant increase occurred in serum ALT, AST, and ALP levels as well as in serum AFP concentrations in the HCC group compared to the control group. aValues are presented as mean ± SD (n = 9). bP < 0.001 compared to group B.
Histopathological results are shown in Figure 1A - C. Normal liver parenchyma is evident in untreated rats in addition to the standard characterization of granulated cytoplasm, central vein, and small uniform nuclei. HCC induced rats demonstrated abnormal, irregularly shaped and enlarged cytoplasm as well as hyperchromatic nuclei with significant variations in nuclear size (Figure 1B and C). The effect of different concentrations (10, 25, 50,100, 250, 500 and 1000 µg/mL) of methanolic extracts from P. nigra body and wall on SDH activity were examined by MTT assay. Mitochondria isolated from hepatocytes of both the control and HCC groups were incubated for 1 hour and then, SDH activity was measured. Statistical analysis indicated a significant (P < 0.05) decrease in SDH activity only in the HCC rats group (Figure 2A and B). We used a range of concentrations for P. nigra total extracts to determine IC50 (SDH inhibitory concentration 50%). The IC50 determined for P. nigra total extract in SDH assay was 500 μg/mL. Then as is usual in this type of studies, we continued our experiments with only 3 sequential concentrations of IC50/2, IC50, 2 × IC50 (corresponding to 250, 500, 1000 μg/mL, respectively). As shown in Figure 3A and 3B, different concentrations (250, 500 and 1000 μg/mL) of methanolic extracts from P. nigra body and wall significantly (P < 0.05) increased ROS formation in mitochondria isolated from HCC hepatocytes. The ROS production induced by mentioned extracts increased as a function of time and concentration. On the other hand, various concentrations of methanolic extracts of P. nigra (250, 500, and 1000 μg/mL) did not cause significant H2O2 formation within 60 minutes of incubation in mitochondria isolated from the control group. The results of our study show that the methanolic extract obtained from the wall of P. nigra was stronger than the extracts obtained from the body of P. nigra in terms of ROS formation (Figure 3A and B). The effect of methanolic extracts from wall and body of P. nigra on MMP was measured by Rh123 staining test. As shown in Figure 4A and 4B, different concentrations (250, 500, 1000 μg/mL) of the given extracts significantly (P < 0.05) raised the absorbance of the fluorescence intensity, indicating the collapse of MMP. Our results showed that MMP significantly (P < 0.05) decreased following the addition of the above extract concentrations at different times within 60 min only in mitochon-dria obtained from HCC hepatocytes. The results of this study show that methanolic extract obtained from the body of P. nigra was stronger than the extract obtained from the wall of P. nigra (Figure 4A and B). Mitochondrial swelling, an indicator of mitochondrial membrane permeability, was studied at 540 nm. Decreasing the absorbance rate indicates a rising trend in the mitochondrial swelling. Our results showed (Figure 5A and B) that methanolic extract from body and wall of P. nigra (250, 500, 1000 μg/mL) induced significant (P < 0.05) mitochondrial swelling only in mitochondria obtained from HCC hepatocytes in a concentration and time dependent manner. As shown in Figure 5 A and B, our results revealed that the methanolic extract obtained from the body of P. nigra was stronger than the extracts obtained from the wall of P. nigra in terms of mitochondrial swelling (Figure 5A and B). As shown in Figure 6A and B, the methanolic extracts from body and wall of P. nigra (500 μg/mL) induced a significant (P < 0.05) release of cytochrome c only in mitochondria isolated from the HCC group. Also, our results showed that in the HCC group, pretreatment of body and wall extracts (500 μg/mL) of P. nigra-treated by cyclosporine A (Cs.A), as an MPT inhibitor, and butylated hydroxyl toluene (BHT), as an antioxidant, inhibited cytochrome c release compared to unpretreated extract (500 μg/mL) of P. nigra-treated mitochondria. Marine species con¬tain various biologically active compounds with strong anticancer properties (8). There is evidence to suggest that such biologically active compounds present anti-tumor properties (7-9). The therapeutic properties of P. nigra are due to the presence of functional biological compounds, which may play a role in the significant suppression of tumor growth (24). Moreover, the presence of flavonoids has been reported in P. nigra (REF). Flavonoids have different pharmacological and biological effects including antitumor actions, which can result in the inactivation of carcinogen, cell cycle arrest, induction of apoptosis, or a combination of these mechanisms (25, 26). P. nigra has shown to significantly induce the inhibition of tumor growth rate in a dose dependent manner (8). GC-MS analysis of the ethanolic extract showed the presence of 2-Piperidinone, Benzeneacetamide, Tetradecanoic acid, n-Hexadecanoic acid, 3-pentadecyl-Phenol, (Z,Z,Z) Phenylmethyl ester of 6,9,12- Octadecatrienoic acid, Cholesterol, Cholestan-3-ol, 3-hydroxy-, (3á,17á)-Spiro(androst-5-ene-17,1’-cyclobutan)-2’- one and (Z)- Phenylmethyl ester of 9 Octadecenoic acid that can prevent several cancers (27). Moreover, dermatan sulfates isolated from P. nigra are composed of the disaccharide core structure (IdoA2-GalNAc). These compounds contain heparin cofactor II (HCII) and have shown to be potent inhibitors of P-selectin (28). The dermatan sulfates can significantly decrease metastasis of MC-38 colon carcinoma and B16-BL6 melanoma cells. In addition, a decrease in the size of thrombus in arterial thrombosis model has been observed (28). This compound has shown to inhibit P-selectin and bind activated platelets during thrombus formation and also, serves as a potential therapeutic product in thrombosis, inflammation, and metastasis (28). The results of this study demonstrated that liver cancer in rats was induced by DEN/2-AAF. There were significant increases in serum markers such as ALT, AST, and ALP, which are indicators of hepatic dysfunction, in the HCC group compared to the healthy control group. It has been well documented that the increasing levels of the given enzymes in blood present liver damage. Additionally, our study showed that AFP, which is another complementary HCC marker, in-creased in HCC-induced rats. It would appear that the DEN/AAF regimen generated genetic alterations in the liver hepatocytes (19, 27). Histopathological findings showed HCC hepatocytes with disorganized hepatic lobular architecture and cellular damage due to liver manipulation by DEN /2-AAF regimen; this significantly differed from the observation in the control group. Mitochondria play a pivotal role in apoptosis pathways. It was reported that a significant difference in the function and characteristics of mitochondria would be observed between cancerous and normal cells. Different size, number, and shape of the mitochondria as well as different structure and genomic alterations have been reported in cancerous cells compared to normal cells. In addition, frangibility of the mitochondria in liver cancer cells has been reported by some researchers (29, 30). Our results showed that the methanolic extract of P. nigra’s body and wall at different concentrations (250, 500, and 1000 μg/mL) and times significantly reduced the activity of SDH or complex II in the HCC group mitochondria compared to the control group mitochondria. In this study, methanolic extract of body and wall of P. nigra at different concentrations and time, significantly increased ROS formation in the mitochondria of the HCC group compared to the control group. ROS are known as intracellular second messengers affecting numerous subsequent cellular processes. In fact, ROS production results from irreversible damage to the cellular constituents and can impair cellular activities. Increasing levels of ROS can affect apoptosis and proliferation pathways (31). Our results indicated that the different applied concentrations of both extracts of P. nigra significantly increased the rate of MMP collapse in mitochondria isolated from the HCC group than those isolated from the control group. The extract from P. nigra’s body reduced the MMP more significantly than the extract of P. nigra’s wall. Collapse of MMP is a major stimulus for subsequent processes, as mitochondrial membrane damage can cause MPT pore-opening and release of cytochrome c into the cytosol, leading to apoptosis and necrosis (32). In addition, the measurement of mitochondrial swelling, as indicator of MPT, showed that both mentioned extracts significantly elevated in the mitochondria obtained from the HCC group compared to the control group. To compare the given extracts, ((5A and B) showed that the body extract of P. nigra increased the swelling of HCC mitochondria compared to normal mitochondria. As hypothesized, apoptosis induction via methanolic extracts of both body and wall of P. nigra is due to oxidative stress and it is dependent on the opening of the MPT pore. The subsequent release of cytochrome c from mitochondria to cytosol as a result of mitochondrial swelling and collapse of MMP was also determined in this study. 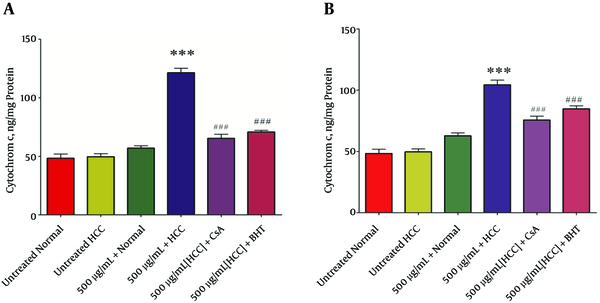 The most important result was that body and wall extracts (500 µg/mL) of P. nigra significantly induced the release of cytochrome c only from the HCC but not normal control mitochondria. Cytochrome c release induced by body and wall extracts of P. nigra was prevented by BHT and Cs.A pretreatments. It has been reported that apoptosis induced by marine species could justify development of non-cytotoxic anticancer treatments, novel apoptosis inducing drug candidates, and effective targeted cancer therapies. In order to reach the given objectives, marine animal bioactive compounds are considered a promising source of new anti-cancer drugs (28). In conclusion, we suggest that the effect of methanolic extracts of body and wall of P. nigra on mitochondria isolated from HCC hepatocyte may be due to the presence of both polar and non-polar bioactive compounds, including flavonoids. Additionally, P. nigra should be considered potentially as a new anti-HCC drug candidate, as we demonstrated that mitochondrial targeting is the key mechanism of the Persian Gulf sea squirt extract. The results presented in this manuscript were partly extracted from Ph.D thesis of Dr. Nina Seyedrazi at Pharmaceutical Sciences Research Center, Shahid Beheshti University of Medical Sciences, Tehran, Iran. The thesis was performed under the supervision of Prof. Jalal Pourahmad. The investigation was financially supported by a research grant (Grant No: 5297) from Shahid Beheshti University of Medical Sciences, Deputy of Research, Tehran, Iran. Authors’ Contribution: Nina Seyed Razi contributed to this research by carrying out the experiments, analyzing the data, and drafting the paper. Melika Nazemi contributed to this research by carrying out the experiments. Yalda Arast contributed to this research by carrying out the experiments. Enayatollah Seydi contributed to the research by carrying out the experiments and analyzing the data. Jalal Pourahmad contributed to this research by formulating the research question(s), designing the study, carrying out the experiments, analyzing the data, and drafting the paper. 25. GC-MS Analysis of the ethanolic extract of Phallusia nigra Savigny, 1816. Proceedings of national conference on frontiers in spectroscopy.